Whilst pondering over what to write for this blog post, I wondered what there was to write about. We don’t discuss religion in my family. I was brought up as an Atheist on my Dad’s side, and non-practising Catholic on my Mother’s. If we ever went to church it would be to a Roman Catholic Church which made me feel uncomfortable because of the statues and the smell of frankincense. I think I went once to a Methodist church with my paternal grandma. I liked that church as it was small and cosy. There were no statues or pictures anywhere and I can’t remember any incense smell. My grandma only drank alcohol at Christmas (from what I know). I chose to be Muslim about 4 years ago. I raise my children as Muslim and like to teach them about Islam and we learn together along the way. So while brainstorming I realised we hear lots of stories from the adult point of view, but it’s the children that we don’t really hear about and how it affects them. And let’s be honest, the world through a kids point of view is much more entertaining. So this morning before school, I did a little interview with my 7 year old. Set the scene, Horrid Henry in the background and a child upside down hanging off the sofa, long hair dangling to the floor. This is how it went. What is Grandma and Grandad’s religion? What do they do as Christians? They go to the pub, celebrate Christmas and Halloween, eat non Halal meat, wear nail varnish and eat sweets with gelatine in. Why is being a Christian good? They have a religion. They are nice and kind. Santa and they can eat whatever they want. Why is being a Muslim good? We get to Pray Salah where we can talk to Allah and ask for things. We get to learn lots. We have Eid (face lights up) when we get presents, give presents, see our friends and go out. What’s bad about you being Muslim and your family being Christian? I can’t eat all the food they have and get told off if I wear hijab inside. What do you like about going to Grandma and Grandad’s? I love them, they are nice. We do lots of colouring, have fun sleepovers and fun days out. What have you learnt from this? My daughter went through a stage last year of wearing hijab all the time. Whether that was to do with people at school, not wanting to brush her hair or a confidence thing I don’t know. She does get told off for wearing it inside, especially by me when she goes to bed in it! As a mother, I have noticed that my daughter is very interested in all religions. She is proud to say her grandma is a Christian. She has the advantage of being in a non-Muslim environment meaning she is equipped with facing certain future challenges. For example, she knows what wine and beer looks like, so she won’t accidentally drink it like I’ve seen some Muslims do. She knows to ask if the meat is Halal. And I’m not quite sure if she takes notice when I’m there, but she knows to check if the sweets are “vegetarian”, and if it contains beetles i.e. cochineal. She realises she is a Muslim and what it means, and doesn’t get caught up between religion and culture. At least not yet. I’m hoping when she goes off into the big wide world these are the values she will act upon. Doing interviews was very fun. It’s a great way to learn a lot about each other. My daughter loved it and decided she wanted to interview me, from which I learnt a lot about myself. This has been very thought provoking in more ways than one. My family may disapprove but don’t show it. There have been some tough times, the hijab is still a touchy issue, and I try not to watch the news with them. But I’m so lucky to have such an accepting, loving family, Alhamdulliah (Muslim word with the same meaning as Hallelujah). Carla is a mother of two; a daughter who is 7 and a boy who is 5 months. She originally set up her Facebook page around three years ago when she had decided to Islamically educate her daughter at home. Equipped with many ideas and two amazing Tajweed teachers, they set off on their journey. They have both learned a tremendous amount about life in general. with baby number 2 on the way she started to read about childbirth. She quickly came across health issues related to boys and plastic. So their other journey towards a zero waste lifestyle began. Islam teaches us so much about environmentalism and both ways of life flow perfectly together. Join them on their journey to teach the next generation about the beautiful religion of Islam and protecting our Earth. 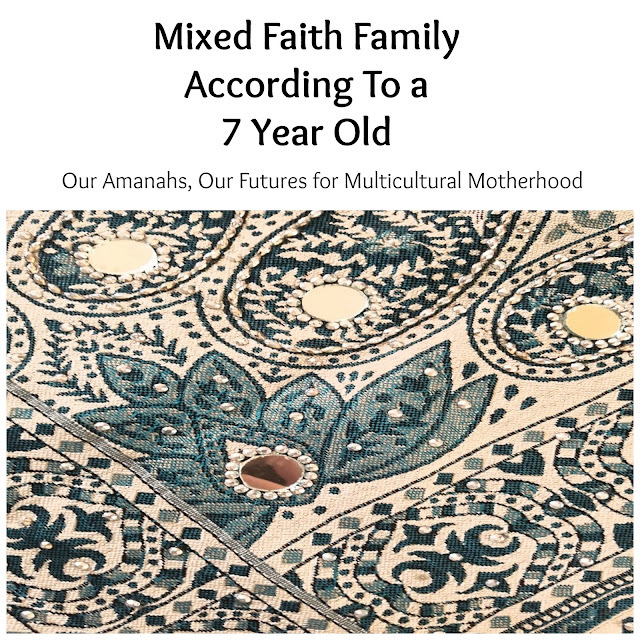 This article is part of a series of article about mixed faith families. Check out the other articles in the series below.